I have reviewed this flight a couple of times before, and it probably is one of my most often flown routes but here is an update review of the economy class service on TG466, Melbourne to Bangkok. The flight is one of two daily flights between Melbourne and Bangkok operated by Thai Airways. The mid afternoon departure gives you a late evening arrival in Bangkok, great for onwards connections to Europe and ideal for those whose final destination is Bangkok as well. I arrived at check-in at about 1pm, 2 hours ahead of departure time. Check-in queues were short and as usual my BMI diamond club status did not show correctly on my boarding pass. This is a never ending problem I have with Thai Airways and BMI. Other airlines I don't have any issue with my BD*G status showing. Anyway, never mind... card in hand I made my way to the Air New Zealand lounge where the staff remembered me and welcomed me in after writing down my BMI card number on a piece of paper. Lounge was pretty quiet and I found that the aircraft was only about 70% full. Boarding was announced and I made my way to my aisle seat in the rear cabin. Fortunately for me, the middle and window seats remained free meaning I had plenty of space to stretch out for a nap. Pillows had been placed on each seat and blankets were handed out by the crew. We pushed back a couple of minutes late and made our way to runway 34 for a departure to the north. The aircraft powered into the sky and we soon set course north west into the late afternoon sun. It wasn't long before the drinks cart made its way down the aisle along with packets of mixed nuts. I had a vodka and ginger ale. Menus had been handed out as well and there was a choice of curry chicken or a roasted fish. I chose the curry chicken which was really delicious and comes in a proper ceramic casserole dish. Well done Thai for still having these when so many airline serve in aluminum foil trays (even Singapore does these days on a regular basis). Thai economy class catering remains excellent with crab meat starter, fresh bread roll, cheese and crackers and a piece of carrot cake too. All were good quality and quite edible. Once the meals had been handed out the crew came around offering extra bread rolls to anyone who wanted them, along with wine and drinks. I took some time away from my book and watched a few TV shows on the Audio Video on Demand System (not pictured here sorry). The entertainment selection was quite good and more extensive than it was a couple of years ago. With the trays cleared away I pushed up the arm rests and made my 3 seats into a makeshift bed and managed several hours of sleep. Many passengers had a seat spare beside them but I was one of the only ones with a whole set of 3, so I counted myself very lucky indeed! The flight path took us overhead Darwin, then towards Brunei and across the South China sea towards Vietnam. The captain announced a period of turbulence somewhere around Brunei and put the seat belt sign on. Shortly after I noticed we had entered some high level clouds and we started to bounce around for the next half hour or so. The turbulence then ended and it was smooth sailing again. Crew came around at intervals with trays of drinks and were responsive when I pressed my call button for a drink. Ninety minute prior to arrival in Bangkok the second meal service was offered which consisted of quite a nice prawn noodle dish, fresh fruits and cookies. It hit the spot quite nicely. With favourable winds we ended up landing some 40 minutes ahead of schedule.... to a remote stand. Once again I was subjected to a crowded bus ride from the aircraft for about 15 minutes to the terminal. At least immigration queues were short and my bag was ready for collection as soon as I was through. 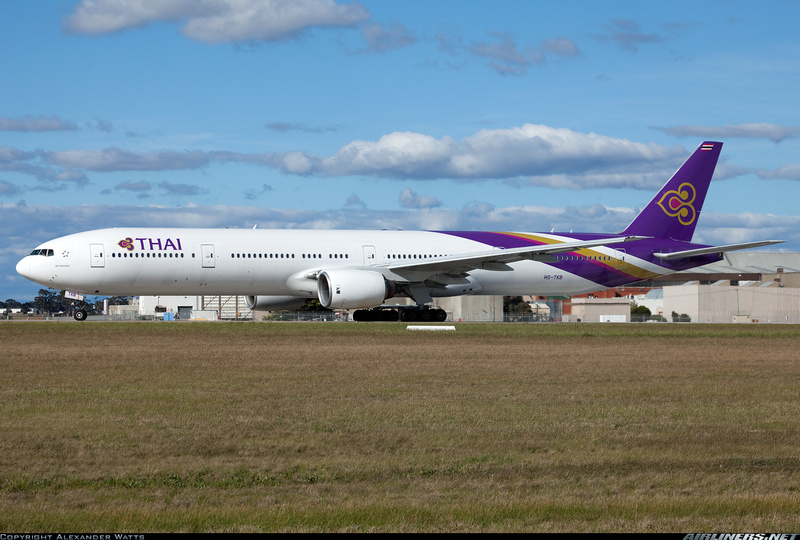 So ends another satisfactory sector on Thai Airways International. Still one of my favourite airlines to travel with in economy class.